Across the world, women’s contribution to economic, social, and political development of a society is an undeniable fact. Yet, as a demographic group, women are perhaps one of the most marginalized and vulnerable group owing to the gender disparity between men and women in many developing countries. This is also a recurring issue in OIC countries, where the severity of gender disparity between men and women, in policies and practices, is more visible in the fields of education, health, family, politics, economy, and decision-making. As a result, women in many OIC countries are not able to fully contribute to the development of their respective societies. 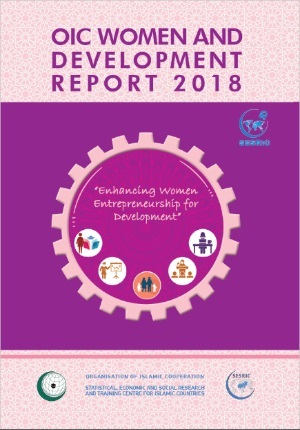 Against this backdrop, the OIC Women and Development Report 2018 is published by SESRIC on the theme ‘Enhancing Women Entrepreneurship for Development’. The report was launched at the 7th Session of the Ministerial Conference on Women’s Role in the Development of OIC Member States that took place in Burkina Faso on 30th November and 01st December 2018. Using recent sets of quantitative and qualitative data, the Report aims to comparatively assess the state of women in OIC countries and identify key challenges faced by women in their economic and social life. The report dedicates a special section to women entrepreneurs in OIC countries and the world. It highlights structural obstacles that affect a woman’s decision to undertake entrepreneurial activities and the importance of encouraging women’s participation in entrepreneurial activities. The report concludes with a set of policy implications on overcoming specific challenges faced by women in OIC countries.